Fine, fine postings here, guys. Peter Revson: When I was devouring motor racing books in the early 1990's I, of course, remembered his name but was especially delighted to find out how much he had done in a relatively brief career. Greg Moore: What a terrific young racer he was, and so much potential. If I remember correctly the drivers were not told of his death until after the race was completed at the season-closer in Fontana in 1999. After a hard fought victory poor Adrian Fernandez couldn't contain himself in the post-race interview and burst into tears. Rodriguez had a sporadic career in F1, two victories in some 54 races between 1963 and 1971, and doing so with a handful of marques: Lotus, Ferrari, Cooper and BRM. In this instance, the numbers don’t tell the story. Not atypical of drivers in that period, Rodriguez willingly participated in all forms of racing. He won at Daytona in 1963 when it was a 3-hour race and again in 1964, partnered with Phil Hill when it was increased to 2,000 km; both times he drove a Ferrari 250 GTO. 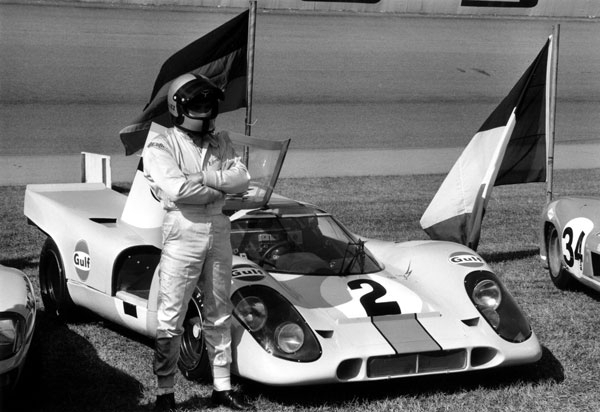 In 1968 he won at LeMans in a Ford GT-40. In the mighty Porsche 917 he returned to Daytona, now a full 24-hour endurance race, and won in both 1970 and 1971. He participated in American sports car championships including the Can-Am and in 1968 he drove for BRM in the Tasman series; hell, he even drove half a dozen NASCAR events. Rodriguez did the best he could with what he was given. 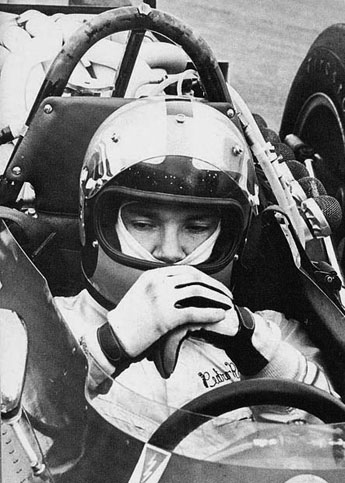 Driving for Cooper in 1967 he managed a win at the season opener in South Africa despite the overweight V12 Maserati power plant and a year old chassis; in fact he managed 6th in the WDC that season competing against superior chassis-engine combinations. However, despite some good outings, he never really showed in F1. Today he is best known and most fondly remembered for his success with J.W. Automotive Engineering. After team owner John Wyer contracted with Porsche to run their new sports car for 1970 he remembered Rodriguez from the fine win he gave his team at LeMans in 1968 and signed him. That would be a marriage that suited both men. The stamina and driving style of Rodriguez was a perfect match for that most beautiful and brutish of cars, the Porsche 917 (a car that never looked more supreme then when it was decked out in the Gulf-sponsored livery of pale blue and orange). This car, introduced in mid-1969 and run sporadically that year, completely dominated the sports car championship for the two full seasons it was campaigned and Rodriguez was the dominant driver amongst a group that included, among others, Jo Siffert, Jackie Oliver, Richard Attwood, Brian Redman, Vic Elford, Hans Herrmann, Leo Kinnunen, Kurt Ahrens and Derek Bell. Keep in mind that Rodriquez was also driving a full schedule for BRM’s Formula 1 team during this same period. The pure skill of the man came to the fore in wet conditions, one of those few drivers who possessed an innate ability to both grasp the notion of the limits of adhesion and to capitalize on lesser souls on track. When you have a little time to spare I would recommend that you poke around YouTube and you’ll find footage to savor. Watch him dive into Eau Rouge full throttle and door-to-door with his teammate, the gifted Jo Siffert. Wrong(ish) thread, I know, but instead of a good man, I'm going to draw attention to a good car....not because of results, but because it just looks great...I'd go so far as to say, this would be the only Ferrari I'd ever ever ever ever ever ever ever ever want to own. The Ferrari P4 is a storied racer – one that had the personal attention of the Commendatore himself as he used it to battle General Motors and the Ford Motor Company on the continent and in the U.S. Here is a brief review of the P4’s development and its start down the road to automotive legend status. Ford’s MkII victory at Le Mans in 1966 against the Ferrari P3 was the compelling event that gave rise to the Ferrari P4. In tracing the history of the P4, it is important to understand the thinking of Mauro Forghieri Technical Director at Ferrari’s Maranello Racing Department from 1962 to 1985. Acting under orders from the Commendatore, Forghieri was told after Le Mans defeat to get to work and build “whatever car you like”. “All I want”, stated Ferrari “is for your sports prototype to win”. Forghieri later noted that more than any other encounter with Ferrari, this episode indicated the kind of man Ferrari really was and the passion he held for the sport of racing – especially endurance racing. Knowing Ferrari’s heart was set on winning the Italian Grand Prix, Forghieri began in earnest to develop his 3 valves per cylinder, V-12. Its polyhemispheric combustion chamber design and 1000 cc cylinder capacity was predicted to provide about 8 percent more power than its P3 predecessor. In addition, Forghieri knew he had to improve the cars power/weight ratio – a strong point of the P3. The new P4 was to be a more powerful coupe redesigned to eliminate the P3’s faults while capitalizing upon its assets. When all was said and done, the V-12 power output climbed from 420 to 450 hp, the compression ratio rose from 10.5:1 to 11:1 at the same 8,200 rev limit as the previous engine. Forghieri included a coil ignition with water cooling and a Lucas indirect fuel injection system. Interestingly, the V-12 performed a structural function in that it actually helped strengthen the chassis. The redesigned 5 speed gearbox, mated to a rear-mounted differential, was beefed up to handle the additional output of the big V-12. Forghieri chose Firestone’s which were noteworthy for their significant increase in width over the previously used Dunlop’s. Although the P4’s wheelbase was the same as the P3’s, the front track was increased from 1462 to 1488 mm and the rear from 1431 to 1450 mm. Rear brakes were moved from the gearbox area to the wheels in order to increase brake cooling. The newly added Firestones required suspension modifications: the P4 used the P3s helical springs, independent wheels and wishbones at the front end and the same components at the rear with the addition of telescopic shock absorbers. The rear suspension also featured two torsion bars slanted toward the front end. The P4’s technical improvements increased its weight an additional 80 kilograms over its P3 sibling.The cars distinguishing bodywork mimicked the P3 although the 4 had thinner and longer lens-reflectors than the 3 and a deeper, more inset air intake at the base of the windshield, broader air intakes for the rear brakes and a flattened tail which incorporated a more pronounced wing. At the end of November in 1967, Ferrari’s Racing Department put two P4’s on a TWA flight from Milan to New York. Forghieri noted that in his years at Ferrari, this was the first time the Commendatore put Prancing Horse race cars in the care of the Prototypes Team to test out an endurance circuit 3 months in advance of the actual event. From New York the cars were trailered to Daytona where the track was reserved on an exclusive basis so as to keep the P4’s track times a secret. Two driver teams (Chris Amon-Lorenzo Bandini and Michael Parkes-Ludovico Scarfiotti) simulated a full 24 hour race with the usual stops to refuel and change tires and drivers. Forghieri recalls that both cars “performed well” and in fact, on several occasions, bested the times clocked by Ford’s MkII driven by the duo of Ken Miles-Lloyd Ruby. Good news about fast cars travels fast and in fact the P4’s simulation race times were so outstanding, word reached Ford and Chaparral very quickly. The Carroll Shelby / Holman & Moody brain trust, responsible for Ford’s sports program, didn’t know what to do as they found their MkII/Bs uncompetitive. Forghieri’s re-engineering efforts and Enzo Ferrari’s competitive drive paid off as Ferrari’s Ford fighters finished 1-2-3 at Daytona, followed by a win in the Monza 1000 Kilometers. In the big race at Le Mans, however, the P4 lost out to the superior 7.0 liter Ford Mk IV, which bested Ferrari’s P4 top end by a significant 15 mph. Ferrari followed with another second place finish at Brands Hatch and finished first overall for the year in the Manufacturer’s Championship. Disappointed by Ford’s win at Le Mans, Enzo decided to walk away from sports car racing in 1968 to focus on Formula One. He stayed away for two years not returning until 1970 but by now the ageing P4 had been replaced by the 512. The heart and soul of the P4 was its V12 engine, about which Enzo Ferrari said “I have always given preeminence to the engine, striving to achieve maximum performance since I am convinced that it counts for more than fifty percent of racing success. Ideas are our strength and the tenacity to back them is our wealth. When I began, I went against everyone’s opinion when I wanted a twelve-cylinder, but that engine, which many people thought would mark the end on my ambitions, can still be recognized in its many children and grandchildren. I have gone down the path of eight cylinders, six cylinders and four cylinders, but the twelve cylinder engine is my traditional and certainly most beloved theme. (Maranello, March, 1985). Some believe Ferrari would have termed the P4 as his “track animal” because of its aggressive look…like a large feline ready to pounce (with 12 cylinder speed) upon its prey. The architectural maxim “Form follows function” applies superbly to the P4. Every line, every curve, every nuance is dedicated to a winning. In all the world of automotive design, the P4 has few equals. How many P4’s are left in the world? As near as anyone knows, there are three and, not too surprisingly, they’re parked behind museum doors. Their value? An estimated $15 million a copy. Fortunately the talent and desire to recreate this automotive legend thrives today…but only for a select few. Superb, thanks for that David, I saw him twice, once in a non-championship F1 race at Oulton Park, think it might have been the Gold Cup, and again at Brands Hatch in the beast of a Porsche. One of the reasons I love these stories about these guys is the amount of driving they did in other races and championships at the same time as F1. Thanks for the great posts people. Let's get this thread back going, yes? Jeff Fuller, a racer from somewhere vaguely around here, has to get some admiration from me. 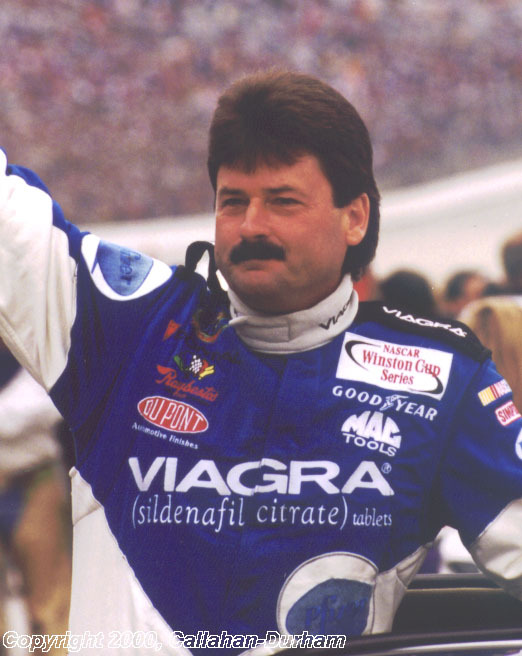 That hairstyle (in this picture, it's 2000, not 1984) and the willingness to drive the Viagra car. Fuller became something of a NASCAR cult hero by being the poster boy (as if anyone with a mullet could be a poster boy) for "start and park," a practice where low budget teams field a second car that simply runs a few laps and parks (collecting money without spending any on tires or fuel to fund another car, or to fund that car for running full distances in future weeks in the case of single-car parkers). In 2004, Fuller parked in all 30 Nationwide races he contested, and since 2001, has parked a total of 54 times in the second-tier Nationwide Series. But there's more to Fuller than those unfortunate stats: in 1996, he took a surprising victory at Bristol, holding off the well-equipped Dale Jarrett, one of the most accomplished NASCAR drivers of the 90s. On top of that, Fuller won 31 races in the Modified tour, a regional division of open-wheel stock cars. It's hard not to respect someone who came from such a grassroots series with a great passion for the sport of stock car racing in its truest and original form (it all started with Mods). Perhaps Fuller's driving never stood out (during my time watching, he was mainly a start and park guy, though I did see him run the Modified twice in his later career when he returned to his roots), but it was hard not to like a guy who just didn't take himself seriously: he wasn't above parking, he wasn't above representing humiliating sponsors, and he wasn't above the mullet. He certainly didn't lack heart. Here's a "wicked" local one: Mike Marfeo. Marfeo races on the bullring short tracks in this area, and with a different marketing strategy, has always been able to attract fantastic sponsors (Dunkin Donuts, for example, can be seen in the picture) compared to most local racers. Yet for all the nice colors and big names, Marfeo was always at the back and only showed up irregularly. It was pretty easy to question why he was out there and poke fun at his pace. And then I learned something about Mike: his son passed away at the age of 2 from brain cancer in 1998. His racing efforts were being used for charity and his ability to attract sponsorship was rather brilliant considering most cars were just backed by family businesses or local automotive places in return for storage/service. It was really hard not to respect that. I remember fondly one night when, completely randomly, Marfeo started rocketing to the front. Using the outside line, the Rhode Island racer took a car suffering from serious oversteer to the lead; these were the first passes I had ever seen him make, and they were damned good ones. It was an amazing display to see him lead lap after lap with his car sliding out from under him on the exit of the corners each time. What easily would have been the most amazing win I had ever seen at the local track slipped away, as a bobble on a restart caused a collision, and Marfeo retired from the lead. In his first kart race (an all-star indoor event in Providence), he wasn't shy to mix it up with the big boys...or confront them post-race in quite the fiery display. Mike's enthusiasm for marketing, his drive to raise charity for a cause very close to him, and some entertaining moments easily make him one of those drivers I won't forget. There's nothing quite like the passion of the grassroots short tracks and Marfeo definitely embodies that. We used to laugh when his 01 pulled out from the tunnel and onto the track; now we applaud. Eric: Thank you for the Jeff Fuller and especially the Mike Marfeo contributions. Given our shared geography, I knew of the latter and some - although not all - of the details you provided. It's not always about the high profile, internationally recognized talents, is it. A little info here: http://www.itv-f1.com/news_article.aspx?id=49546 As soon as I know when it's to be run, if there's anyone that wants it, I'll try and get a copy over to you... I'm guessing it'll be on ITV PLayer so can save it to disc. Thanks for the post/notice on Sheen and Hunt, old timer. And, yes, you should fill up your tank with high octane and provide us with your next profile.